← Richard Curtis to bring Red Nose Day to the USA! Anglophile Alert! The GREAT Kate Wait is nearly over! Catherine, The Duchess of Cambridge has gone into labor with her second child! She was driven to St. Mary’s Hospital at 06:00AM London by car, accompanied by Prince William. She was admitted into the Lindo Wing where it was confirmed her labor was progressing along normally. 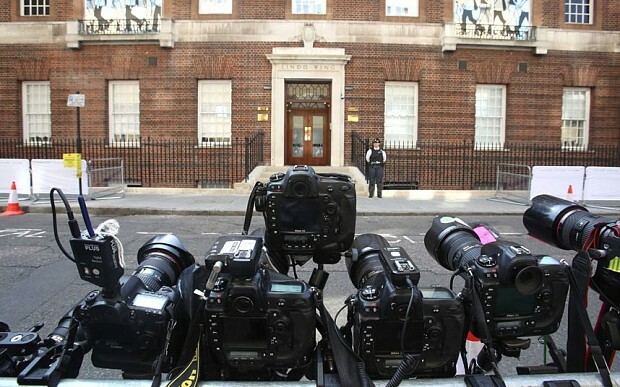 The media has already been allowed into the press pen where they will wait out the arrival of the second royal baby born to The Duke and Duchess of Cambridge. Wasting no time…the press is already in place. The arrival of the Duke and Duchess of Cambridge’s second child will be announced in a very modern way when Kensington Palace Tweets the announcement of the birth! In addition to the contemporary approach there will also be the traditional framed proclamation that will be placed outside of Buckingham Palace. A Royal Proclamation announcing Prince William’s birth. Tweeting a royal birth announcement is fairly new practice as Prince George was the first future British monarch to have news of their birth tweeted by a royal household, with @ClarenceHouse declaring “Her Royal Highness The Duchess of Cambridge was safely delivered of a son at 4.24pm”. You can follow KP’s Twitter account @KensingtonRoyal. 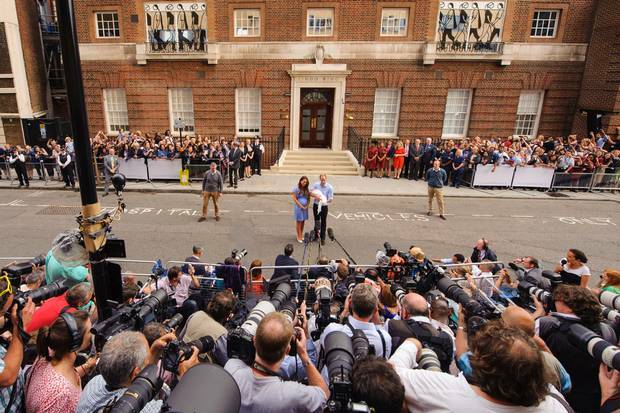 One unforgettable moment with the birth of Prince George was when Prince William and Catherine presented their newborn son to the world’s press. What an amazing site this was. No word yet on whether or not we’ll be seeing a repeat of this scenario after the Cambridge baby is born. How the world met Prince George. Stay tuned….we will soon know whether we can welcome a new little Prince or Princess to the world! Lady Anglophile….knitting pink baby booties, just in case. This entry was posted in Rule Britannia!. Bookmark the permalink.